✸THE MOST POWERFUL SHOE SPRAY DEODORIZER AND STINKY FEET SOLUTION YOU WILL EVER FIND✸ Packed with 8 powerhouse ingredients like Apple Cider Vinegar, Peppermint Oil, Tea Tree Oil, Thyme Oil, and Eucalyptus Oil, this all-purpose shoe odor eliminator & shoe and foot spray will eliminate any odor you can think of! Sprayzee is the #1 rated best shoe deodorizer on Amazon. Just compare our reviews to any other shoe spray and you'll immediately see why! ✖︎ NEW EXTRA STRENGTH FORMULA ✖︎ Our new Extra Strength shoe deodorant formula with 8 robust Therapeutic Grade Oils is guaranteed to kill your smelly shoe odors. If you're not satisfied within 30 days, just send us and email and we'll refund every penny. ✔︎ 100% NATURAL & SAFE - MADE IN USA. Being 100% chemical-free, aluminum-free, and paraben-free, you can spray Sprayzee anywhere and on anything. It's a safe solution for foot powder for kids smelly feet since there are no harmful substances. And because it is a natural product, it's best if used before 6 months. ✔︎FRESHENS BETTER THAN DEODORANT BALLS, POWDERS, INSOLES. With shoe deodorizer odor balls, you have to wait days before they work. Sprayzee takes the stink away with just one spray! ✔︎ ELIMINATE ODORS AT THE SOURCE. Bad odors are caused by bacteria and fungi. And with the antibacterial and antifungal powers of Essential Oils and Apple Cider Vinegar, Sprayzee not only smells amazing, it completely eliminates odors by helping kill the source as an antifungal foot and shoe spray. This shoe deodorizer with tea tree oil and other essential oils may also help with mens and womens athletes foot due to its antibacterial properties. ✔︎ USE ON ANYTHING! 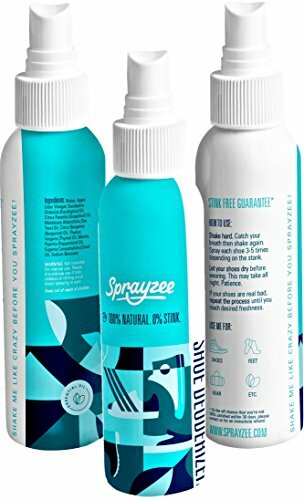 You can use Sprayzee for your stinky shoes and feet, socks, organic fabric freshener, running shoe deodorizer, antibacterial spray for gym equipment, climbing shoe deodorizer, foot powder for smelly feet kids, outdoor pet odor control, odor eliminator balls, powder fresh spray deodorant, shoe odor neutralizer, 100% all natural deodorant with tea tree, mens shoe deodorizer, shoe deodorizer for women, and even a bath cleaner sprayer for your bathroom. Get CRAZY with Sprayzee! If you have any questions about this product by Sprayzee, contact us by completing and submitting the form below. If you are looking for a specif part number, please include it with your message.